I’m deep in the planning phase of launching a new and playful conference this July, with my co-chairing colleagues from Manchester Metropolitan University (Nic Whitton and Mark Langan). Our simple concept is to see what engaging things happen at the intersection of learning, play and games. We’re planning the conference around this, eschewing standard ‘paper reading’ sessions for more playful workshops or interactions; arranging some playful activities and surprises around the sessions and through the evenings; but most importantly setting up an environment where the surprising might happen. This is a great little insight into the game design process behind the hugely popular Angry Birds mobile game. Note how familiar concepts (eg. catapults) were close to being dismissed, but ended up being the main engaging mechanic in the final game. A slightly overdue mention of a great resource and group in London who are focussed around educational game development and use. Set up by Kirsten Campbell-Hughes in 2011, with Martha Henson joining her in 2012 after working on some of the fabulous games in the Wellcome Collection (amongst other great things), edugameshub is an informal blog collecting together some great posts from designers, developers and teachers around educational games. They also run #LEGup gatherings in London for educational game developers and designers, for those in or visiting the area. ..but the rest of the site (and the meetups) are well worth checking out while you’re there. Shiny new copies of a rather special book arrived in the post today. Around a year ago, I started to seek out examples of games used in education that eschewed the usual focus on digital, and instead focussed on more traditional forms: using cards, or dice, or group activity, to engage learners and teach them through playing. With my co-editor Nic Whitton, we uncovered thirteen fascinating examples of truly creative game design – all built around learning aims, but with a focus on core game design principles. In most cases, the development costs were minor: materials used ranging from blank cards and felt-tip pens, to short-run boxed board games. More importantly, none of the creators are professional game designers – they are teachers, lecturers, trainers who identified a need in their own context. What this book presents is therefore something we’re very proud to have assembled: thirteen important, fascinating and useful case studies which span a range of educational levels and modes, that provide anyone interested in developing good, engaging (and most of all, fun) learning games with a wealth of ideas and advice. As a coda, the book finishes with a chapter by a professional board game designer who describes the tricks of the real trade. It’s available later this month direct from Routledge, or from Amazon (with a Kindle version to follow soon). A fascinating find in southeast Turkey from around 3000BC was revealed this week: a collection of board game pieces of different styles/functions found together (image below and original story from Discovery News). This adds weight to the evidence of game playing using boards and counters in the region during the early bronze age – the earliest example being Senet from predynastic Egypt, with more elaborate boards and counters found in the royal cemetery of Ur in ancient Mesopotamia, also dating from around 3000BC; while the still-played Go (or Wei-qi) appears in Asia in around 2000BC. This is, though, the first evidence of a collection of different game pieces (possibly indicating variation of roles in a game, or a variety of different games) collected together purposefully. Today (26th July) is the third annual Day of Archaeology – a fabulous idea devised by Lorna Richardson (of UCL) and Matt Law (Cardiff University/ C & N Hollinrake Ltd.) back in 2011, and now curated by others including Daniel Pett of the (equally fabulous) Portable Antiquities Scheme. The idea is a simple one: anyone who works in or around Archaeology, in any role, writes a short blog post describing their day. This year, as ever, it has created an incredible picture of the variety of roles influenced by Archaeology, and makes a compelling case for the usefulness and pervasiveness of the subject. You can find my post here (with a puzzle to try, for those problem-solving readers) but have a good nose around all the posts – there are some great stories and surprises to discover. 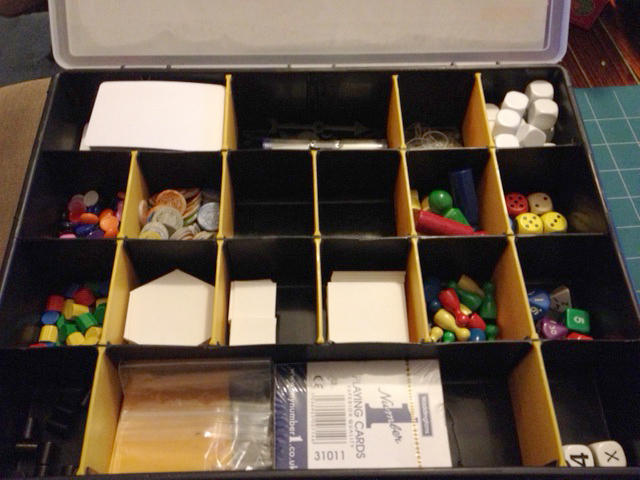 As I’m finding myself creating more and more simple traditional games (involving boards, cards and dice) within my teaching, workshops and design projects, I decided to pull together a box of resources so that I had standard game components to hand for prototyping. I did a bit of reading around, and found that most professional game designers build up similar resource boxes over time, usually by collecting components from old or second hand games. There are also, though, a number of suppliers who provide individual components in whatever colour or shape you like. To keep things cheap, I mixed these approaches together – salvaging some components from old and otherwise tattered games we’d grown out of as a family, visiting Leicester’s excellent independent toy store (Dominoes) to get various coloured and multi-sided dice, cutting square and hexagonal tiles out of thick board with a stanley knife, and slotting everything into a cheap DIY parts box. 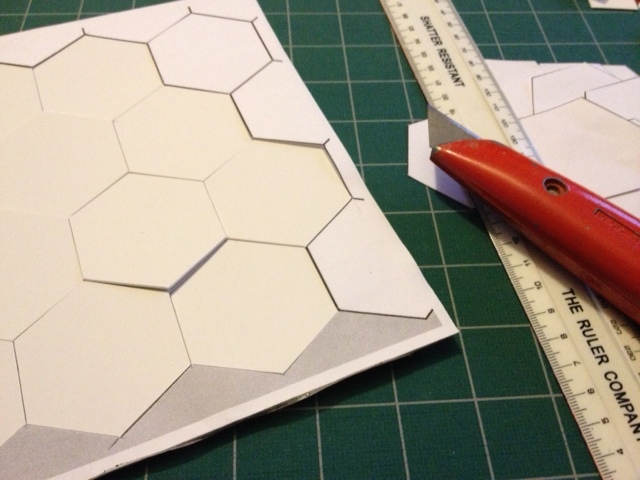 Altogether, it cost around £20 to assemble – but will provide enough materials for countless game prototypes over the coming years. Who have almost every game part you might ever need. For a huge list of resources, companies etc. useful in both the design and production of a board game. …and Ebay and Amazon for cheap dice, blank cards etc. (look around – I picked mine up for pence).